A picturesque dormitory village in the southeastern foothills of the Pentland Hills, West Linton lies on the Lyne Water, a tributary of the Tweed, 15 miles (24 km) south of Edinburgh. Known as Lyntoun Roderyck until the 12th century and as Lintoun until the 19th century when 'West' was added, it was the birthplace of Bernard of Lintoun who drafted the Declaration of Arbroath in the 14th century. 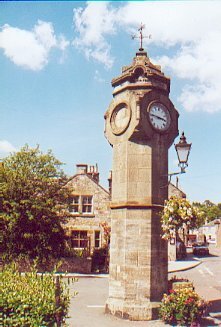 One of the oldest market settlements in Scotland, it was the scene of large sheep markets and in the 17th century was associated with silver and lead mining as well as stone carving largely created by local laird James Gifford. The village was served by a railway between 1864 and 1933 and is now a conservation area. An annual celebration held in June is associated with the old horsemen's mutual aid society, the Whipmen, founded in 1803.